The female is about 3/4 – 1 inch in length. They are mostly brown, except for some yellow along the front and side margins. 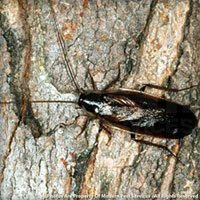 These burrowing insects prefer loose soil or loose litter. They thrive in hot and humid conditions such as Florida and Texas. They are often introduced to greenhouses, zoos and offices by potted plants. Hiding during the day, they can go unnoticed until the population has grown quite large. 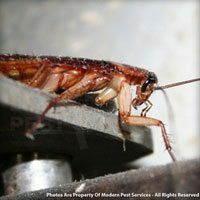 For more information on keeping your home roach-free, get a quote or contact your local pest control specialist today! 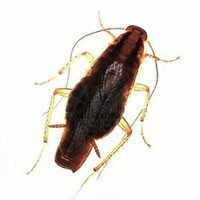 They feed on plants, and can cause considerable damages in greenhouses and atriums. 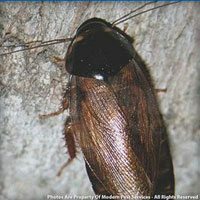 The female Surinam cockroach produces eggs without fertilization by a male cockroach. The female carries her egg capsule inside, until the young emerge. On average, the capsule contains 26 eggs, and the female can produce a new capsule 48 to 82 days later.